Finding new employees can be a daunting task. You have to create and post job opening advertisements, screen resumes and calls from interested parties, spend time making phone calls and performing interviews and, ultimately, decide which candidate is best for the job. The last thing you want to do is worry about coming up with a job application for applicants to complete. 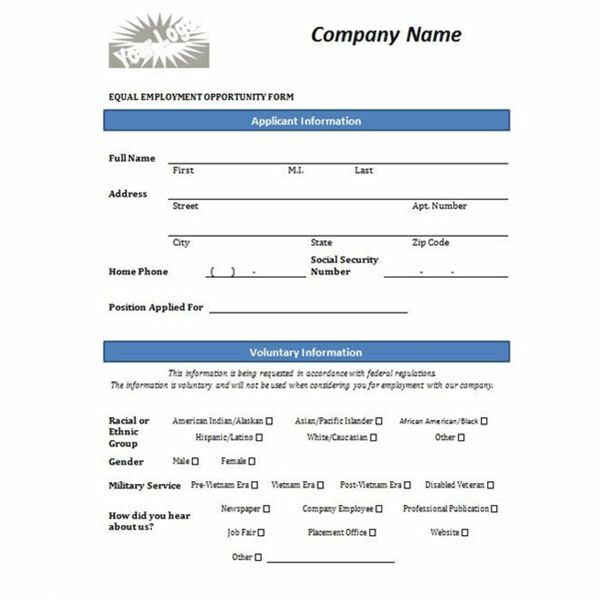 Following are four employment application templates are ideal for small businesses. You can download any or all of these templates and modify them to suit your needs. All of these templates are for Microsoft Word and are in .dotx format. They are compatible with Word 2007, 2010 or 2013 as well as Word 2003 provided you have installed the Office Compatibility Pack. 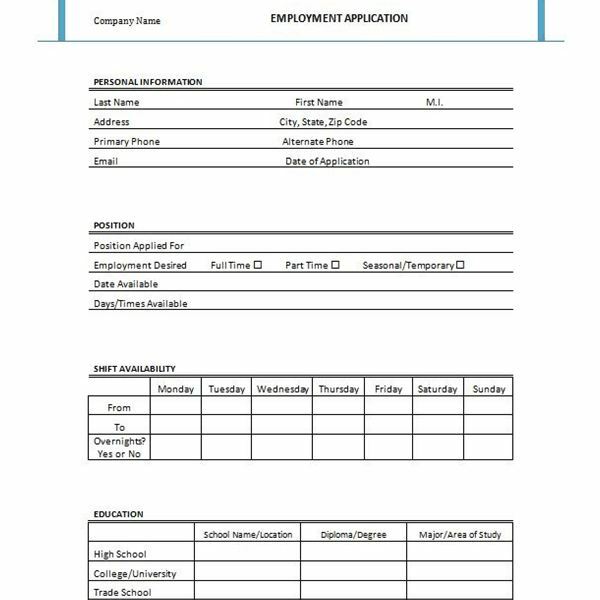 If all you need is a basic job application, this might be the ideal template for you. The header includes two blocks in shades of grey with “Application for Employment" in the left section and an area for you to add your company name or logo on the right. You can change the colors of this block, as well. To change this information in Word 2007 or later, select the Insert tab, click Header and select Edit Header. The first section of the application has lines for the applicant’s information. The second section briefly asks about the position and salary desired as well as the applicant’s availability. The remainder of the template includes sections in which applicants can list previous employment information, education details and contact information for personal references. Jobs in retail, fast food and similar industries have unique requirements from and often a different type of applicant than other businesses do. For instance, retail stores may be looking to hire temporary staff to work through a busy holiday season. Both restaurants and retailers often need employees who are willing to work varied shifts, weekends, holidays and even overnight hours. In addition, applicants often include students and others who only want to work part-time or need a flexible schedule. This template allows for these necessities by including a section for shift availability. The header includes sample text that you can replace with your company name and the words “Employment Application." To change or customize this information in Word 2007 or later, select the Insert tab, click Header and select Edit Header. The first two sections allow applicants to enter their personal information and details regarding the type of position they seek. Next is the shift availability section, in which applicants can list the hours they are available to work each day of the week and state whether they are willing to work any graveyard shifts. The remainder of the template includes sections for education, employment history, special skills and references. 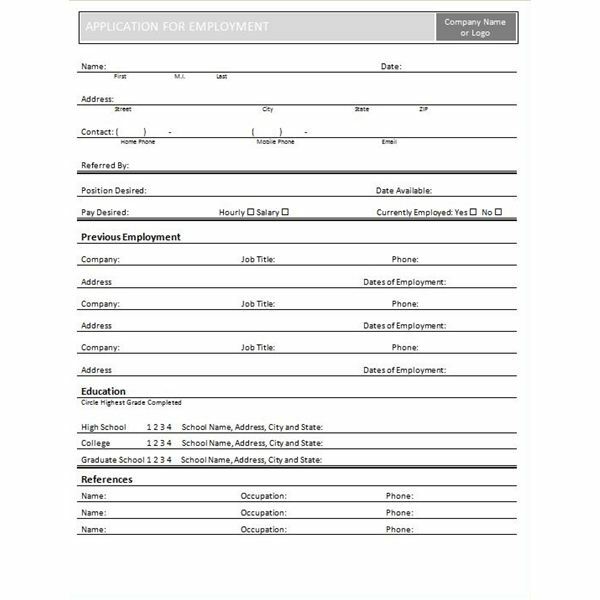 If you would like a job application form that you can allow applicants to fill out on a computer kiosk, via email or online, you might prefer this template. Not only can job candidates type directly onto the lines on the application, but it also includes check boxes they can click to select. The header of the application template includes sample text and a sample logo you can replace with your business name and logo, as well as the words, “Application for Employment." You can customize these by editing the header. Next is the applicant information section, which includes a date picker content control. When an applicant clicks Click here to enter a date, a calendar appears from which they can select the date. The next section also includes a date picker control for the date available. Applicants can select “Yes" or “No" check boxes to answer questions on the bottom half of the first page, such as “Are you a citizen of the United States?" The second and third pages include sections for education and military history, previous job experience and references. The final template is actually a job application supplement. 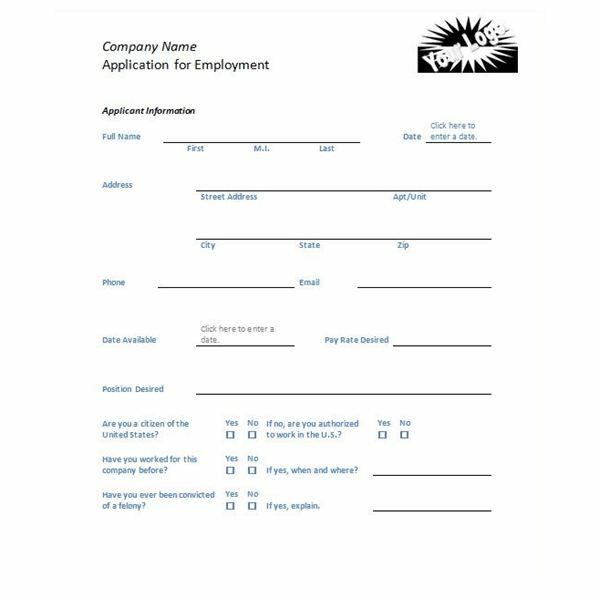 You can use this form in addition to a job application to gather information for EEO report filing as well as internal analysis to ensure your business complies with federal statute and regulations. You can customize the header of this template to add your business’s logo and name. The form can be completed electronically or printed and filled out by hand. Download the template you feel will work best for your business or save all of them to decide which one is most appropriate.